A clean-cut vision of a future freed from the rat's nest of cables needed to power today's electronic gadgets has come one step closer to reality. 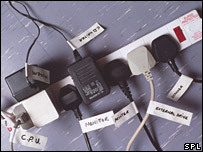 US researchers have successfully tested an experimental system to deliver power to devices without the need for wires. 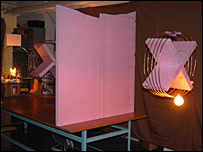 The setup, reported in the journal Science, made a 60W light bulb glow from a distance of 2m (7ft). 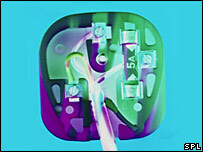 WiTricity, as it is called, exploits simple physics and could be adapted to charge other devices such as laptops. "There is nothing in this that would have prevented them inventing this 10 or even 20 years ago," commented Professor Sir John Pendry of Imperial College London who has seen the experiments. "But I think there is an issue of time. In the last few years we have seen an exponential growth of mobile devices that need power. The power cable is the last wire to be cut in a wireless connection." 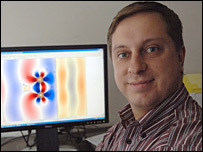 Professor Moti Segev of the Israel Institute of Technology described the work as "truly pioneering". "We had a strong faith in our theory but experiments are the ultimate test," said team member Assistant Professor Marin Soljacic. "So we went ahead and sure enough we were successful, the experiments behave very much like the theory." Measurements showed that the setup could transfer energy with 40% efficiency across the gap. The bulb was even made to glow when obstructions such as wood, metal and electronic devices were placed between the two coils. "These results are encouraging. The numbers are not far from where you would want for this to be useful," said Professor Soljacic. When two objects have the same resonance they exchange energy strongly without having an effect on other surrounding objects. There are many examples of resonance. "If you fill a room with hundreds of identical glasses and you fill each one with a different level of wine each one will have a different acoustic resonance," explained Professor Soljacic. This was a rudimentary system that proves energy transfer is possible. Each glass would ring with a different tone if knocked with a spoon, for example. "Then if I enter the room and start singing really loudly one of the glasses may explode if I hit exactly the right tone." Instead of using acoustic resonance, WiTricity exploits the resonance of low frequency electromagnetic waves. In the experiment both coils were made to resonate at 10Mhz, allowing them to couple and for "tails" of energy to flow between them. "With each cycle arriving, more pressure, or voltage in electrical terms, builds up in this coil," explained Professor Pendry. Over a number of cycles the voltage gathered until there was enough pressure, or energy, at the surface to flow into the light bulb. This accumulation of energy explains why a wine glass does not smash immediately when a singer hits the right tone. "The wine glass is gathering energy until it has enough power to break that glass," said Professor Pendry. Using low frequency electromagnetic waves, which are about 30m (100ft) long, also has a safety advantage according to Professor Pendry. "Ordinarily if you have a transmitter operating like a mobile phone at 2GHz - a much shorter wavelength - then it radiates a mixture of magnetic and electric fields," he said. This is a characteristic of what is known as the "far field", the field seen more than one wavelength from the device. At a distance of less than one wavelength the field is almost entirely magnetic. "The body really responds strongly to electric fields, which is why you can cook a chicken in a microwave," said Sir John. "But it doesn't respond to magnetic fields. As far as we know the body has almost zero response to magnetic fields in terms of the amount of power it absorbs." As a result, the system should not present any significant health risk to humans, said Professor Soljacic. The team from MIT is not the first group to suggest wireless energy transfer. Nineteenth-century physicist and engineer Nikola Tesla experimented with long-range wireless energy transfer, but his most ambitious attempt - the 29m high aerial known as Wardenclyffe Tower, in New York - failed when he ran out of money. Others have worked on highly directional mechanisms of energy transfer such as lasers. However, unlike the MIT work, these require an uninterrupted line of sight, and are therefore not good for powering objects around the home. Professor Soljacic and his team are now looking at refining their setup. "This was a rudimentary system that proves energy transfer is possible. You wouldn't use it to power your laptop. "The goal now is to shrink the size of these things, go over larger distances and improve the efficiencies," said Professor Soljacic. The work was done in collaboration with his colleagues Andre Kurs, Aristeidis Karalis, Robert Moffatt, John Joannopoulos and Peter Fisher.